Frankincense Hydrosol: A truly unique hydrosol that is excellent for the skin. We like to use it externally as a lovely facial toner. Geranium, Bourbon (ONC): This lovely, yet powerful, oil is said to be a tonic to the nervous system, quell anxiety and depression, and lift the spirits. Lavender, True (O): A calming and relaxing essential oil that should be a basic oil in any aromatherapy toolkit. Check out our site for more information about these wonderful materials and many more essential oils and hydrosols. 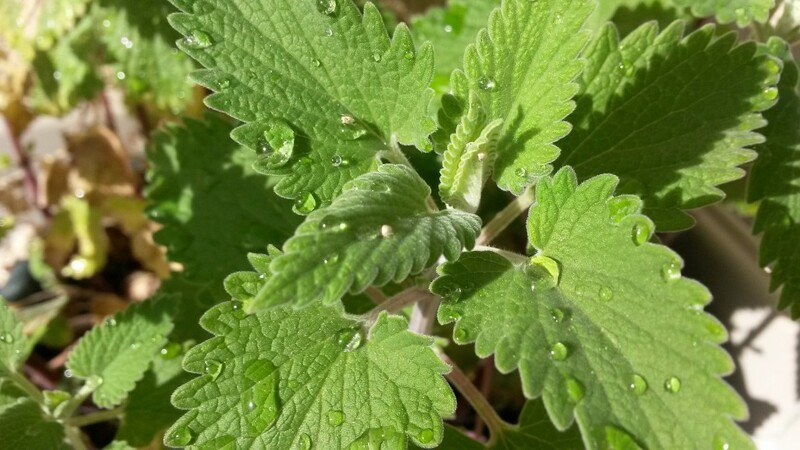 Researchers report that nepetalactone, the essential oil in catnip that gives the plant its characteristic odor, is about ten times more effective at repelling mosquitoes than DEET — the compound used in most commercial insect repellents. This summer, try our wild-crafted Catnip Essential Oil in an outdoor diffuser. Or try a spray made with our catnip hydrosol. We’ll definitely be using these products on the farm! Winter is approaching .. and we really need to pay special attention to our ‘skin’. Here are some tips that may assist you with the ‘dry skin blues’. * Hydrate your entire system with lots of water and high anti-oxidant green tea. During winter there’s a tendency not to drink as much due to cool temperatures. You may want to bring your water to room temperature to encourage drinking more. * Eat a healthy diet of mostly raw foods, foods high in omega-3 fatty acids which produce a hydrating effect from the inside out, and antioxidants which help fight signs of aging. Winter might be a good time to increase your intake of omega-3s — and antioxidants such as Turmeric. * Take a revitalizing bath – in warm water, not hot! Himalayan salt baths are rejuvenating, and help dry skin to slough off. Hot water is damaging to your skin, so stick with warm water. * Moisturize daily with non-clogging all natural moisturizers. They will nourish your skin instead of clogging it, as many toxin-impaired moisturizers do. * It’s especially important to cleanse and moisturize before you go to bed at night, to remove impurities from your skin. Take 5 minutes our of your day and you will be on the road to a vibrant face and healthy skin. What to do? Adjust your water temperature to be a bit cooler, limit your showers to one per day, and decrease your soak time in the bath. * Use gentle and safe all natural skin care products. Your skin absorbs it all. * Be sure to remove your makeup each evening. It’s a really bad idea to flop into bed, leaving makeup – not to mention environmental grime – on your face while you sleep. Take a couple minutes to remove it, and you will find your face looking and feeling younger. * If possible sleep on your back. Gravity creates a downward drag on your skin all day. Give your skin a break at night. By sleeping on your back, you reduce gravitational pull on your face. If you press your face to your pillow, you will likely experience increased puffiness in the morning. * Please – Do not smoke… for your general health’s sake, and for younger looking skin. Smoking causes free radical production, which is one cause of the signs of aging. (not to mention all the other illnesses associated with smoking). * Apply your skin care products to warm skin, usually after your shower or after you wash your face, in order to help your skin appear healthier. This maximizes absorption, as your pores are open and will absorb better. If your skin is cold, use a warm towel to warm your skin. * Be patient. Don’t expect changes overnight, don’t be discouraged. It may take a month or even two to three months to see any changes. Bath Salts : Soaks & Body Scrubs. Be kind to your skin .. show it some TLC (tender loving care) .. and your skin will glow ! It’s almost a done deal. We are about to see herbal preparations disappear, and the ability of herbalists to prescribe them will also be lost. Click here to read this article. Pause to appreciate the beauty around you. Whether rainbow or butterfly, mountain or tree, painting or poem – whether crafted by nature or by a human hand – beauty adds a magical element to life that surpasses logic and science. Enjoy the beauty of the Fall Season .. the colors .. the scents of the first fire burning ..
Pergola is almost ready. Can’t wait. Thank you Rudy ..
Sun dried tomatoes with fresh garlic and basil in extra virgin olive oil a dash of salt and pepper. The economic times in the country is really not the best. Yet, we are hopeful and carry on .. as usual. We are a resilient bunch and even though we are not as happy with the political climate and all the (empty) promises that were given .. we are still hopeful. The saying is .. where there is life .. there is hope. And so, we hope, for good health care, more jobs, etc. must be done and feeling guilty when it is not accomplished. The fire flies are out and my garden looks enchanting as they twinkle in the evening light. I know its summer when I see them. Mandy will be giving a talk on August 6th at the New York Botanical Gardens on perfumed tea as a part of the Edible Evenings series during this summer’s The Edible Garden at The New York Botanical Garden. – a wonderful Organic Wintergreen from Nepal. It has a beautiful soft pink color and the scent is just delicious.! – aged Sandalwood Sri Lanka 2007 – a deeply sensuous essential oil for both men and women. – Cinnamon Bark Organic (NOP) Sri Lanka warm and spicy. Be sure to care for your skin, especially if you are out enjoying the beach, park, riding your bike .. please remember to hydrate your skin and drink lots of fluids. A good way and easy way to do this is with Hydrosols. Rosehip is especially wonderful and cooling as is the Peppermint. To read about our many different Hydrosols please visit our page. ‘ Deep summer is when ..
so that we can get in touch with you!! The drawing will be on July 30th, 2009 ! !